Tips offered for fishing the most popular and common fish in all of Oregon, the widely distributed trout. More people in Oregon fish for trout than for any other kind of fish. Anglers can experience a lifetime of varied and rewarding adventures fishing for trout in Oregon's shaded coastal streams, alpine lakes, urban ponds and high desert rivers. A general Oregon fishing license is all that's required to fish for trout. Youths 12-17 years old need a juvenile angling license and kids under 12 fish for free. Trout are widely distributed and can be found in almost any water body that provides cool, clean water. They need food such as aquatic insects, minnows and crawfish, with cover and protection from predators. Trout habitats are often divided into lakes and ponds or rivers and streams. Fish location, behavior and fishing tactics will vary depending on whether you're fishing in still waters or moving waters. In still waters, trout are on the move, "cruising" the water looking for food. At the same time, trout don't want to get too far away from cover that offers protection from predators. Some likely places to look for trout in lakes and ponds include near or above aquatic vegetation, around logs, stumps, rocks or other structure. Trout like to be at stream inlets where streams flowing into the lake or pond are bringing cool, freshwater and likely a supply of food. They can be found in deeper waters, especially in the warm summer months when trout are looking for cooler water, as well as protection from overhead predators. The best time of year to trout fish in lower elevation lakes is in the spring and fall when the water is cooler and the trout are more active. That also is when most lakes are stocked. In the warm summer months, anglers can look for trout in cooler, deeper waters, or in high mountain lakes that remain cool year-round. In warmer parts of the state, such as the Willamette Valley or along the Coast, trout fishing in lakes or ponds can be good well into the winter months — for anglers hardy enough to brave cold and wet weather. In moving waters, trout tend to hold in one spot and wait for the water current to bring food to them. A primary food source for those fish is aquatic insects adrift in the current. In addition to looking for food and protection from predators, trout in moving waters are also looking for a place to rest from the current. So some likely places to look for trout in rivers and streams are behind rocks or other structures, near steep or undercut banks and in deeper, slower pools. Most rivers and streams fish best in the spring and fall when water temperatures are cooler. Few rivers and streams are stocked, so you'll likely be fishing for naturally reproducing or wild fish. As the water gets warmer, look for trout in faster riffles where the water gets re-oxygenated as it tumbles over rocks. Some rivers, especially in Central Oregon, are open for trout year-round. Fishing can be good in the winter months and for hardy anglers willing to brave the cold and snow, look for trout in slow, calm waters where they don't have to fight the current. There are lots of ways to fish for trout, but three of the easiest ways to fish for trout in lakes are suspending your bait under a bobber. Start with a piece of worm or a little PowerBait or similar product on a bait hook. Attach a small, lead weight just above the hook to help the bait sink, and add a bobber 1.5 to 3 feet above the hook. Cast out to a likely spot and wait for the bobber to wiggle, dive or jerk. That is a good technique when fish are cruising nearer the surface or when you want to keep your bait and hook suspended above a weed bed. Sometimes trout are in deeper water and the bait needs to be down deep where the fish are. In that technique, there is no bobber to suspend the bait. Instead, the lead weight is attached about 1.5 feet above the baited hook and cast out. The lead weight will sink, but the bait will float up and hover 1.5 feet above the bottom of the lake. Spinners mimic small minnows, leeches and other favorite trout food. When fishing a spinner or spoon, cast it over trout-habitat-looking water. Let it sink for a minute, and then begin reeling it in. Vary the amount of time you let the spinner sink and the speed of the retrieve until you find the combination that catches fish. 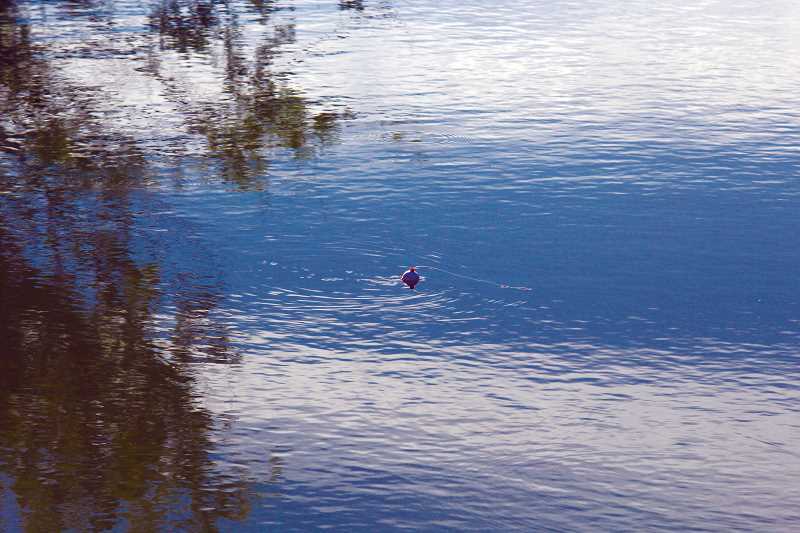 In moving water, it is the current, instead of your retrieve, that will affect how your lure moves in the water. You can begin by casting the spinner slightly upriver and reel in any slackline. As the current carries the spinner down river, hold as much fishing line off the water as you can to achieve a natural "drift." Once the spinner has swung toward the shore and is straight down river, begin a moderate retrieve. Drift a worm or an artificial bait with enough split shot to get within a few inches of the bottom. Sometimes adding a bobber will help keep track of where the bait is drifting. Where a river slows and deepens into a pool with very little current, you can use many of the same trout fishing techniques you would use in a small pond or other still water. Wherever you go, be sure to check the Oregon Sport Fishing Regulations for the daily bag limits, bait restrictions or other fishing guidelines for the specific lake, river or stream you'll be fishing. Each year, the Oregon Department of Fish and Wildlife stocks over 7 million trout in lakes, ponds and reservoirs throughout the state. Those hatchery fish are raised and stocked for anglers to take home and enjoy on the grill or in the frying pan or oven.